Victorian Bridal Miniature on Ivory with Gold Embellishments. The term miniature generally refers to a portrait miniature. 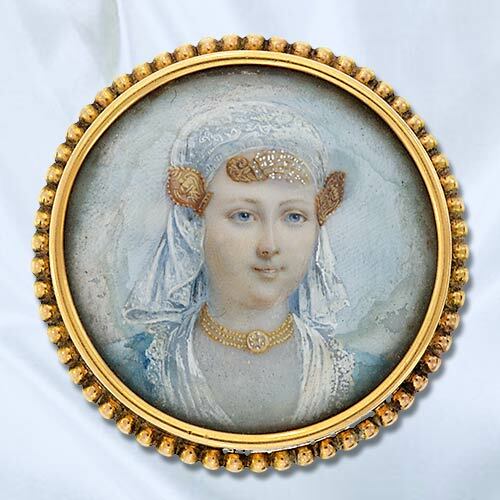 Prior to the invention of photography, these portrait miniatures were very popular. Commonly portrait miniatures were executed in gouache, watercolor and later enamel. Miniatures of famous paintings, landmarks and landscapes were produced, but none of these came close to the popularity of the portrait miniature. The art of miniature portrait painting was at its peak during the 16th, 17th and 18th centuries. Not only were these miniatures painted as mementos of loved ones, but often they were used as a kind of identification or introduction. Because of their diminutive size, they could be carried in a pocket or valise and they decorated watches, brooches, snuff boxes, jewelry boxes and the like. Watercolor on vellum was the medium of choice early on. In Germany, Italy and the Netherlands, many portrait miniatures were painted in oil on copper. After 1750 or so, enamel on copper gained in popularity. During the 18th century, there was a return to watercolor as the medium of choice, only this time the portraits were painted on ivory. With the development of the daguerreotype and photography, the art of the portrait miniature fell into obscurity.